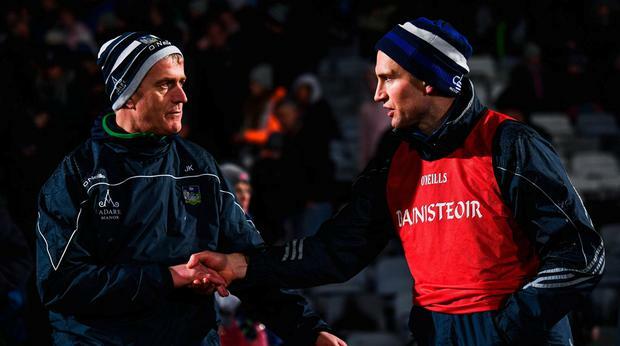 Limerick hurling boss John Kiely is an exacting task-master. 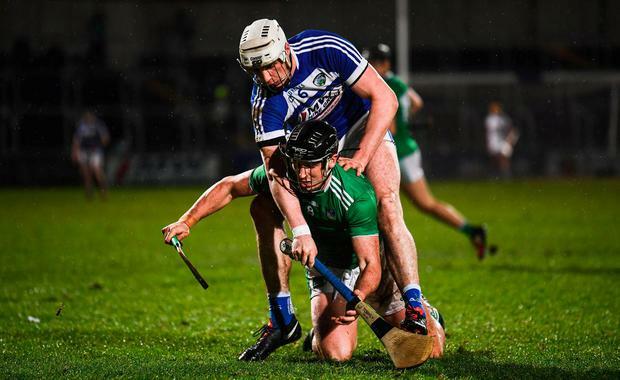 His second string hammered Laois by 17 points in Portlaoise on Saturday in pouring rain, but he was underwhelmed by aspects of their performance. "Pleased with some bits, not too happy with other bits," he said. "I thought we did well in the first half. We worked hard, did well on our own puck-outs and we were economical with our shooting by and large. "Laois got off a lot of shots but maybe not from the areas that are going to threaten most. But they were very, very good on their own puck-out. Very hard for us to get a stop on that and that was a launching pad for many attacks." Kiely suggested his side had turned over too much ball and he was also unhappy that they allowed Laois out too easily with the ball. "They got too many of those short pucks out and we didn't stop them from building them forward. We need to deal with that in a more cohesive fashion. "They're little bits and pieces, our touch was a little bit off, overshooting passes, fellas not on the shoulder when the handpass was laid off. "In the second half, I think the game got a bit untidy, both sides made a lot of changes. The game lost a bit of momentum and a bit of its shape and as a result both sides didn't get anywhere near the level of performance they did in the first half. For us, it's a case of job done, plenty of work to do and we've two weeks now to get ready for the semi-final." Such was the slickness of Limerick's play in the first ten minutes when they outscored the home side 1-5 to 0-1, it's hard to believe that only six of their All-Ireland-winning team were on duty. Full-forward Seamus Flanagan, who roamed all over, was their top scorer from play with 1-2. He started and finished the move which led to their fifth-minute goal which set them on their way. Conor Boylan scored their second goal four minutes from the break to give them a lead of 11 points (2-11 to 0-6) at half-time. 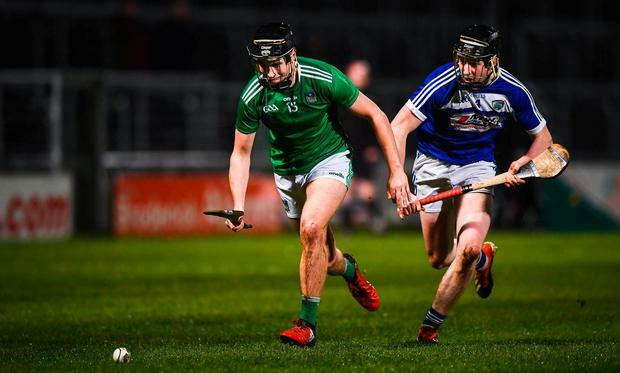 With man of the match Gearóid Hegarty tormenting the Laois defence, it was a tortuous night for the home side's supporters, though they were outnumbered by the visiting fans in the attendance of 4,800. Laois lacked nothing in effort but their first touch was poor and their shooting was woeful - they hit 18 wides. "To get to the level that the top teams are at you have to execute those chances," acknowledged Laois boss Eddie Brennan. "Looking back on the campaign the most pleasing aspect was we got what we wanted to get (a place in the Division 1 next season). "When you are facing that (deficit) at half-time, it is very difficult to pick yourself up. All I asked the players at half-time was to go out in the second half and just keep going and apply themselves which they did. There is plenty to work on. "They are the All-Ireland champions and I can assure you there is no All-Ireland won easy. We are trying to get up and be competitive. But at the end of the day we are a McDonagh team. So are we going to face into a team as well-drilled and as slick again? Probably not. 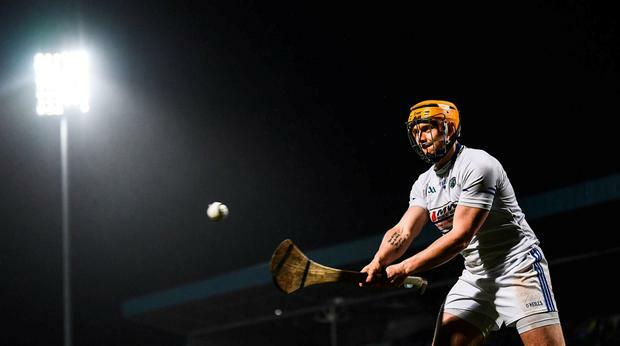 "There is a gap there; they are a top-tier team - simple as that," said the former Kilkenny star. Scorers - Limerick: B Murphy 0-8 (7f), S Flanagan 1-2; C Boylan 1-1, G Hegarty, P Casey 0-3 each, D Hannon, D Byrnes (f), R Hanley, D O'Donovan (sl), D Dempsey 0-1 each. Laois: M Kavanagh 0-6 (5f), E Rowland (f), L Cleere, J Kelly, P Purcell, A Dunphy 0-1 each. 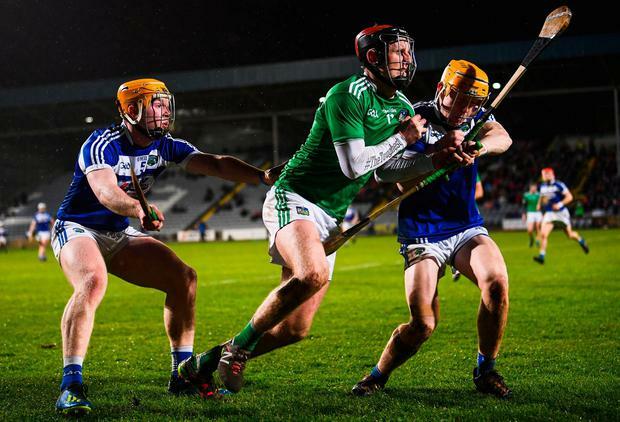 Limerick - B Hennessy 7; T Condon 7, D Morrissey 8, W O'Meara 7; D Byrnes 7, D Hannon 8, B Nash 7; D O'Donovan 7, R Hanley 7, G Hegarty 9, D Dempsey 7, C Boylan 7; P Casey 8, S Flanagan 8, B Murphy 8. Subs: A Costello 7 for Condon (h-t); D Reidy 6 for Casey (46), S Dowling 5 for Hegarty (55); C Ryan 6 for Hanley (58); A La Touche Cosgrave 5 for Byrnes (63). Laois - E Rowland 7; J Phelan 6, M Whelan 6, D Hartnett 6; P Delaney 6, R Mullaney 6, L Cleere 7; J Kelly 6, S Downey 6; P Purcell 7, M Kavanagh 7 A Dunphy 6; M Dowling 5, N Foyle 6, S Bergin 5. Subs: PJ Scully 5 for Bergin (46); S Maher 5 or Dowling (53); D Connolly 5 for Downey (59); A Bergin 5 for Foyle (65).